The Living Atlas of the World sports a bold new look and capabilities, making it easier to find, contribute, and comment on content such as maps, layers, scenes, apps, and tools. The Living Atlas of the World, redesigned in February 2017, offers one of the largest compilations of curated local, regional, and global geographic information in the world. You can find thousands of items in the Living Atlas, which receives its data from proprietary Esri content and contributions from Esri's partner and user communities. This content has been approved by Esri subject matter experts, meaning that you can use it with confidence for your mapping and analyses. Having this content readily available via the atlas also saves time and money. "This work represents a very exciting transformation in GIS," said Clint Brown, director of software products at Esri. "The Living Atlas is a collection of the best available content for all themes worldwide. The information items that we are collectively sharing and using come from not only our own systems but also every other organization that's sharing maps and data layers online." The Living Atlas website was redesigned to make both the browsing experience and the item contribution process easier and more straightforward. Users can search for content directly from the Home tab, which is located on the landing page. A powerful new search engine was added to the site, making content discovery intuitive and easy. Typing "#water" will return all items regarding water. You can see additional search examples by pointing to the Search Examples link. 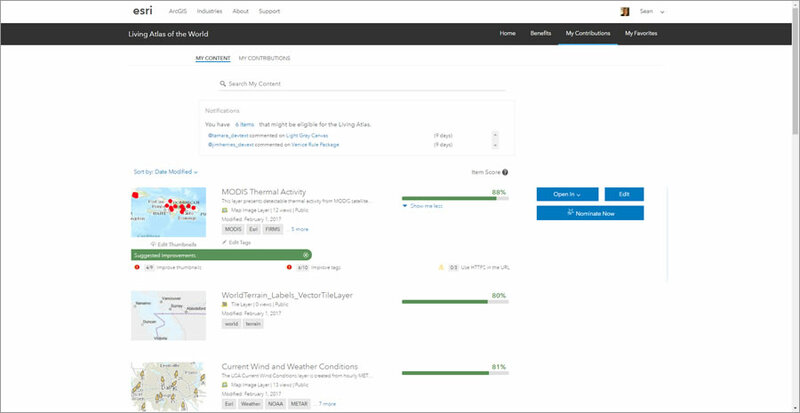 You can filter the data by content type—such as maps, layers, scenes, apps, tools, and time—and by when the item was last modified. You can also filter your search by theme and subtheme. For example, clicking the Demographics icon will only display the demographic item types. 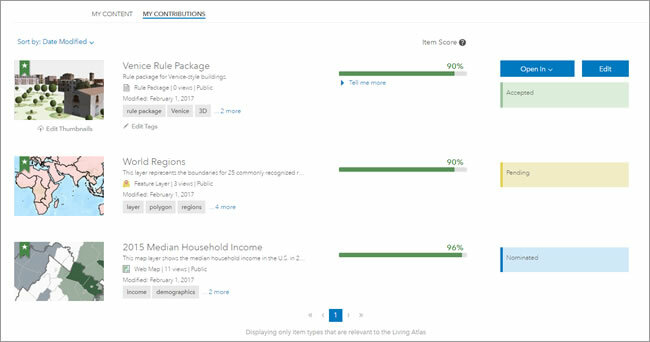 If you click the down arrow beside Demographics, you will see subthemes you can filter by, such as Income, Spending & Behaviors, Population & Housing, Business & Jobs, and Poverty & At Risk. The items are listed as cards on the pages and provide details such as title, thumbnail, content type, and author's name. You can point to a card to read the item description and the dates of its creation and modification. You can open an item directly from the card as well as mark it as a favorite and share it through RSS feeds, Twitter, Google+, and Facebook. For example, the card for Terrain: Multi-Directional Hillshade displays the item's thumbnail, imagery layer item type, esri_landscape author name, and the icon for subscriber content. When you point to the card, the item description and the creation and modification dates appear. You can contribute content and check on the status of the items nominated for the Living Atlas through the My Contributions tab. This tab is separated into two additional tabs—My Content and My Contributions. The My Content tab displays all of a user's items. The My Contributions tab shows all the items that have been nominated and their statuses. The Search bar and notifications are displayed at the top of the My Content tab. Here users can see how many items they could potentially contribute to the Living Atlas and any comments on their items. You can click an item to learn how it can be improved and nominate it for the Living Atlas. The My Content tab displays all of a user's items, along with each item's thumbnail, title, summary, item type, number of views, sharing properties, modification date, tags, and score. Each item is given a score based on certain metadata elements. The top score possible is 100 percent, and the item must have a score of 80 percent or above in order to be nominated. You can point to Item Score to learn more about how items are scored. If the item has been nominated, is pending or under review, or has been accepted into the Living Atlas, you will see a green badge on the item's thumbnail. When a user clicks an item and the Tell me more link, the Suggested Improvements list will appear along with an error or warning icon and the score for that element. Error icons are red, and warning icons are yellow. Errors must be fixed before an item can be nominated for the Living Atlas. You can point to a suggested improvement to learn how it can be addressed. You can also edit the thumbnails and tags directly through the My Contributions tab. Click Edit Thumbnails under the item's thumbnail to add both a custom standard-size thumbnail and a high-resolution thumbnail. Both thumbnails are required for nomination. Click Edit Tags underneath the tags to add them. At least four tags are required, with a minimum of one Living Atlas tag. If the item has already been nominated, is under review or pending, or has been accepted for the Living Atlas, the item's status will replace the Nominate Now button on the My Content tab. The My Contributions tab shows all the items that have a Living Atlas status. You'll see the item's thumbnail, title, summary, item type, number of views, sharing properties, modification date, tags, score, and status. Each of the items will also have the green badge, as each has a status. You can still click the Tell me more link to learn ways you can further improve your items. 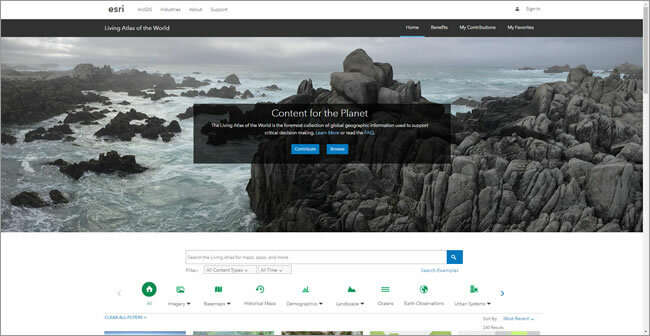 Brown encourages people to use and contribute content to the Living Atlas. "The Living Atlas of the World contains more than shared, raw datasets. It also contains amazing geographic intelligence that we can all leverage and use: online maps, data layers about every kind of topic, imagery and elevation, space-time observations and forecasts, sophisticated analytics, a huge array of apps, and story maps," he said. "And it's living—it continues to grow in use and participation through contributions from the global GIS community." The Living Atlas of the World website redesign makes the discovery and nomination of content straightforward. Living Atlas items can help you complete your work faster. And by contributing content to the Living Atlas, you will help the entire GIS community.